Investors turned against biotech, Internet and other once-soaring stocks on Thursday, driving the Nasdaq composite index down 3.1 percent, its worst day since 2011, and spooking Asian investors on Friday. The sell-off in tech names dragged down the broader market and left all the major U.S. indexes in the red for the year. Steep declines in tech, followed by rebounds, have become a familiar pattern in the stock market in recent weeks. After falling Monday, the Nasdaq and other major indices rallied over the next two days. On Thursday, stocks dropped again, led once more by biotech and technology companies. On Friday, Asian stock markets were lower Friday as investors dumped technology stocks again. 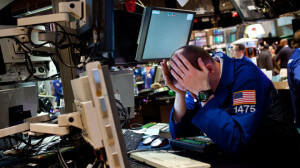 Tokyo’s Nikkei 225 lost 2.1 percent to 14,000.43 and South Korea’s Kospi slipped 1 percent to 1,989.07. Hong Kong’s Hang Seng dropped 0.8 percent to 23,005.76 and China’s Shanghai Composite Index fell 0.6 percent to 2,121.71. Australia’s S&P/ASX 200 dropped 1 percent to 5,426.90. Stocks in Taiwan and Southeast Asian countries also lost ground. The drop in the tech-laden Nasdaq index worried technology investors in as jitters spread that Internet and related stocks are over-valued.The slide represents a shift in investor psychology. After chasing their huge gains in 2013, investors are worried that stocks like Facebook and Gilead Sciences, which doubled last year, have become too expensive. And it’s not just lofty prices that have made those sectors volatile in recent weeks. Regulators are scrutinizing the costof cutting-edge biotech drugs. Worried investors may remember how tech and biotech sectors inflated the dotcom bubble of the late ’90s which, when it burst, was followed by recession from 2000 to 2002. Wary, they are shifting from riskier investments to safer areas like utilities, health care and consumer staples. Few companies escaped Thursday’s downdraft. Of the Nasdaq’s 100 largest stocks, only one, C.H. Robinson Worldwide, a freight company, closed higher. Several factors likely combined to send stocks lower, said Randy Frederick, managing director of trading and derivatives at the Schwab Center for Financial Research. Frederick said that recent IPOs, many of them tech and biotech companies, have become overheated. At the same time, the market hasn’t had a 10 percent decline since spring 2012, only smaller dips in the 4 percent and 5 percent range. McLean attributed the slump to investors worried about the end of the Federal Reserve’s easy money policies. The previous rally in stock prices was driven, in part, by the Fed’s commitment to record-low interest rates. In recent years, the Fed has aggressively bought bonds to hold down borrowing rates and accelerate spending, investing and hiring. It’s also kept its benchmark short-term rate near zero. The Fed’s supporters say low rates have helped nourish a still-modest economic rebound. By artificially depressing bond yields, the Fed led more investors to shift money into stocks. Some have argued that the Fed-engineered rates produced an economic sugar high that has lifted stocks too much. Despite assurances from the Fed that it isn’t in a hurry to raise interest rates, some investors remain wary. The Nasdaq ended the day down 129.79 points to 4,054.11. It is now down 7 percent from its recent high reached March 5. Other major index also fell, but not as much. The Standard & Poor’s 500 index dropped 39.10 points to close at 1,838.08. It is now down 2.09 percent for the year, although it still remains close to its all-time reached April 2. The Dow Jones industrial average lost 266.96 points to 16,170.22. It is off 1.6 percent for 2014. Gilead Sciences slid $5.17, or 7 percent, to $65.48 on Thursday. Biogen Idec dropped $13.33, or 4 percent, to $287.35. Still, the S&P 500 had its best day in a month on Wednesday. The index remains near its record high. Stocks had a huge run-up in 2013, and are in the sixth year of a bull market. Bill McColl contributed to this report, with The Associated Press.